St Mary’s Church in Wanstead has reached out to the public to help them raise money to restore their 17th Century painting. 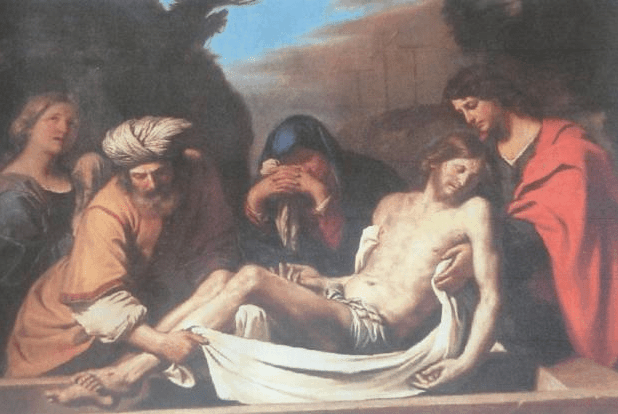 Much to their relief, it has been confirmed that their painting is a contemporary studio copy of The Entombment of Christ, by Il Guercino. The painting has had pride of place above the altar in the Grade 1 listed Church since 1890. Guercino was one of the leading artists of his time. He was born in 1591 and lived in Rome. The original is currently hung in Chicago’s Institute of Art. It was there that John Garlick, a local parishioner, decided to investigate the painting further. When questioned, the curator of the art institute was very interested, as there are very few copies of this painting. He came over to see it, where he confirmed it was a copy. Had it have been the original painting, their insurance costs would have increased dramatically. The painting is currently dark and dingy due to the the environmental conditions it had been kept in, but it was once wonderfully bright and colourful. They are hoping to have the painting restored in time for their Christmas Carol service, providing they can raise the £30,000 in order to carry out the work.